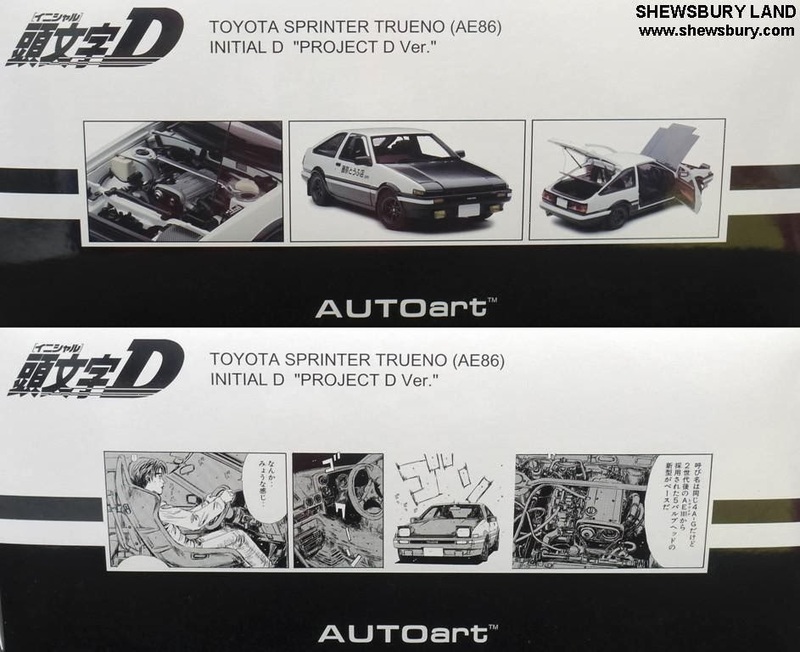 This is a 1/18 scale die cast car model of Toyota Sprinter Trueno (AE86) from the popular Initial D anime series with the updated look (mainly that carbon fiber engine hood cover) based on "Project D" as seen in the anime. 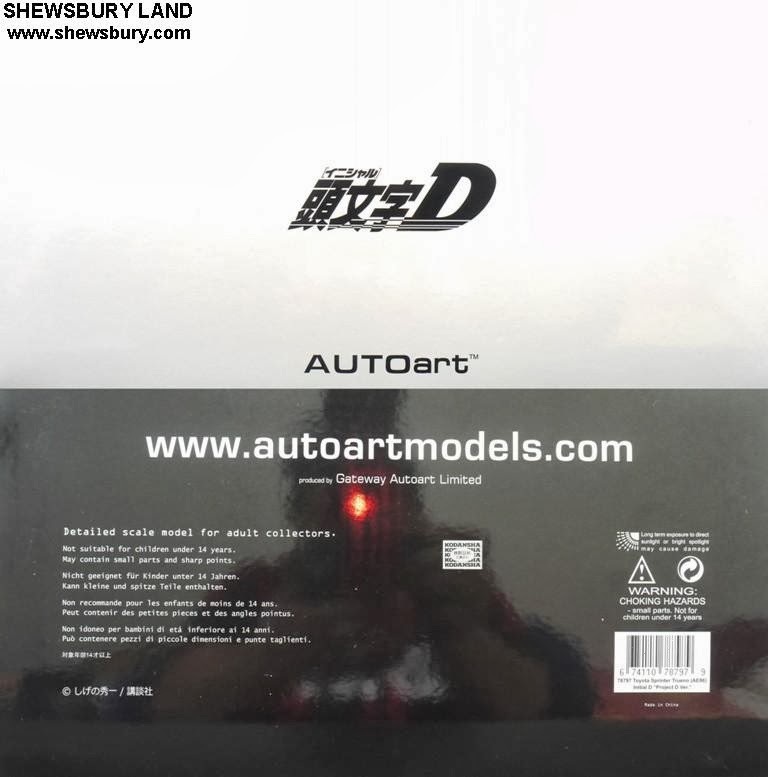 This die cast car model is produced by Auto Art, a well known brand/company for producing scaled die cast car models with great detailing that seems to be almost the same as the real model. If you are a die cast car model collectors then I guess you at least knew about Auto Art, their brand's and products. So this is now the most popular 86 - the one that appear in Initial D anime and this car is indeed the main inspiration for the modern Toyota FT86 and Subaru BRZ and beyond that certainly this car have such a unique popularity amongst classic Japanese car enthusiast and those who familiar with drift sports series around the world. Keiichi Tsuchiya, a popular veteran in Japanese motorsports world love this car so much and he have 1 unit of it presented to him by Toyota TRD. One thing unique about this car is that it is suddenly become popular again starting in the late 1990's thanks to that anime "Initial D" and the rest is history. Since then, the price/value of this car (and the siblings - Levin AE86) on the second hand market suddenly increase and little by little this car become "rare" and "special" to the point that many peoples start repairing their old "86" or those that they could find somewhere from the junk yard and make this car appear on the road once again and the rest is history. The casting and painting finishing quality is superbly excellent while the exterior marking, additional parts and accessories are made from the best material - certainly great - it is indeed from Auto Art. The interior detailing is brilliant, almost real, exactly what we could expect from Auto Art at this scale and price point. There is a lot more to observed on the interior though it's pretty hard to do using camera lens but if you happened to have this model, you would love to spend some time admiring the interior of the car - it's not as fancy as the modern Audi car but surely you can feel the classic elements when you look at the interior detailing accordingly. Again, it's job well done by Auto Art. 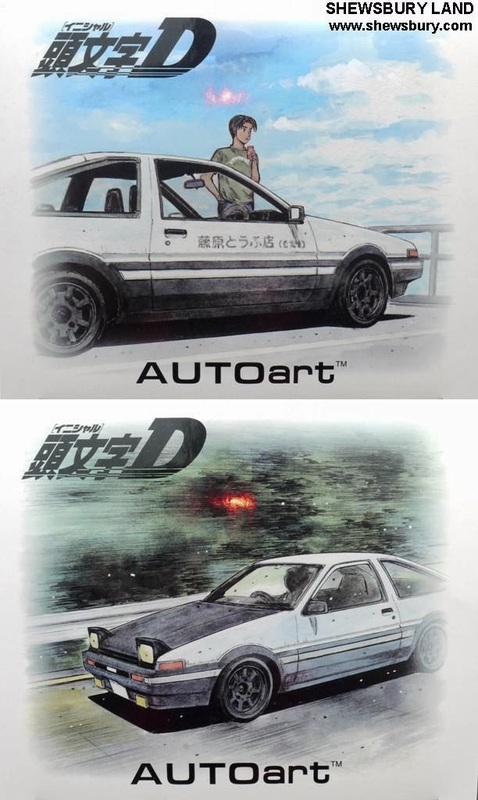 Overall, this is an excellent representation of the legendary Toyota Sprinter Trueno (AE86) of Project D team from Initial D anime. Everything from the casting quality, painting finishing, fittings and detailing are all at the best level and I can understand why this particular model was long sold out even before they released it to the mass. At SGD 193.00 (about USD 150 / EUR 110 / 15,707 Yen) it is indeed quite pricy but I think the high quality finishing of this item deserved such commanding price and surely over time the price of this item will increase further in E-Bay. Just like many other Initial D fans or die cast car collectors who managed to get this item, I'm pretty happy with it, it may not be the greatest car to some of you but for us the fans of the series, this is really meaningful and the joy to have it is simply unexplainable.